Parker, who has also published five collections of poetry, chronicles Avi’s obsession and his quest to discover the truth about his mother with non-stop humor and wildly imaginative language. Avi’s mother has died, and he’s staying in her house in the small-ish town of Elsbeth, North Carolina, in order to settle the estate. It’s not his childhood home, though, because his mother left the family when Avi was a kid, and he’s had limited contact with her since. So he has no particular emotional attachment to the house itself or its contents, except for the guilt he feels over his estrangement from his mother, for which he blames himself. But, sleeping in the house, he has a dream that he can’t shake: a workman, tools, the inside of rib-ceilinged cavern, and his mother. A little of each, as it turns out. Oddball characters aside, the book’s convoluted plot follows Avi’s attempts to unravel the mystery of “the list” that The Camel and the others are after as well as the secret of the large sum of money he stands to inherit from his mother. Her lawyer is no help, and neither are the neighbors (another odd character, this one named Sascha, also known as Mario), but eventually Avi begins to move closer to the truth with the help of Lima Bean, of whom Avi has grown quite fond. But what’s it all about? Besides being a fun romp with extremely memorable characters, and simple illustrations that might put the reader in mind of The Little Prince (although the similarity ends there), the book is tackling bigger themes of forgiveness and redemption. Avi feels responsible for the split with his mother, and it’s clear that she felt the same, but her legacy—it’s more than just money, as he learns—helps him get past that. He’s also able to learn trust and, ultimately, find love, not an inconsiderable feat. 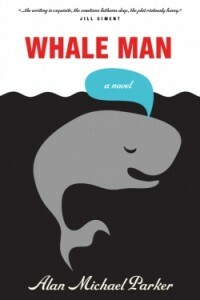 What matters, though, is that Whale Man is a terrific, entertaining read that weaves Parker’s poetic concision and offbeat sense of humor into an engaging tale. NOTE TO READER: Clifford Garstang and Alan Michael Parker are friends. CLIFFORD GARSTANG is the author of the short story collection In an Uncharted Country and the Editor of Prime Number Magazine. He received an MFA in fiction from Queens University of Charlotte. His work has appeared in Virginia Quarterly Review, Shenandoah, The Tampa Review, and elsewhere and has received Distinguished Mention in the Best American Series. He won the 2006 Confluence Fiction Prize and the 2007 GSU Review Fiction Prize and has received Fellowships from the Virginia Center for the Creative Arts, Kimmel Harding Nelson Center for the Arts, and the Sewanee Writers’ Conference. Sounds like a book worth checking out. I like the art-historical lean!